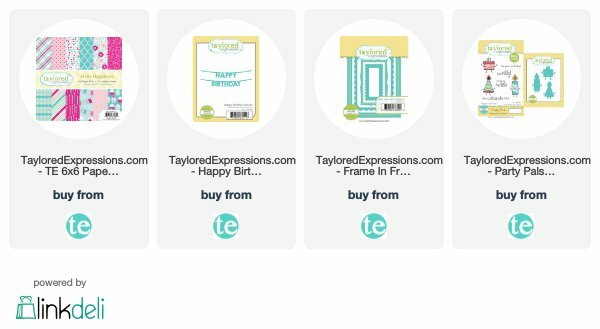 Taylored Expressions is celebrating! Why you ask? 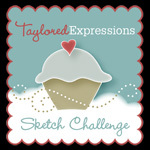 Well in case you hadn't heard, Taylored Expressions is turning 10! As many of you know, Taylor and her amazing company is very near and dear to my heart. I virtually met Taylor through Amy Rysavy's blog back in 2007 when I signed up for an ATC swap. Ohhhh those were the days. I began to follow Taylor's blog and her famous "cupcake challenges." It was shortly thereafter she opened up her online store. How many of you remember the set that started it all? Oh that beloved Cuppie! I was obsessed with this cutie. It's hard to believe that was 10 years ago. I knew from the beginning I wanted to be involved with Taylor's team in some fashion. I was happy to be a devoted customer in the interim *wink wink*. Then came my all time favorite TE product - Key Ingredients Kits! I am a sucker for all in one kits. Give me stamps, paper and embellishments and I'm one happy stamper. I went all in when Taylor had a KI design team call and wouldn't you know it, I made the team! Today we are celebrating with almost 40 designers that have been part of Taylored Expressions over the past 10 years. To see who all is involved in the hop today link back to Taylor’s blog - https://tayloredexpressions.com/blog/ - to get the full list and hop along with us. For today's celebration, I had to ink up this fun set called Party Pals. Doesn't it just make you smile? I had so much fun coloring these cuties. It felt great to play with my Copics again. Can't believe how long I've been away. The fun "Happy Birthday" banner is also a TE die. Don't you love it? I colored it in with clear Spica glitter pens. Thank you for stopping by today's celebration. I hope you enjoyed taking a walk down memory lane with Taylor as much as I did. Happy weekend! I hope today's post finds you happy & healthy. I've been up to my eyes with cards this weekend. I have about 95% of all the cards I've made over that past several years and I'll be participating in my first craft fair next weekend. Boy it's a lot of work pulling out all of the cards. It's been fun seeing how my stamping has evolved. Do you ever look back at your stuff? Yeah, as you can see I'm already onto the next holiday. Sorry Thanksgiving. I didn't do too much stamping relying on my dies to help me out. I love this tree from Taylored Expressions. As I was editing my card I noticed I omitted the flag. Boo! I still think it works. I can't wait to see what the other gals did with this awesome sketch. Be sure to check them all out and give them some bloggy love back!! I hope you will all play along with this great sketch! Happy day after Halloween. As you may have noticed I took a little break. I sprained my right hand and wasn't able to color. Talk about adding insult to injury! Well I'm back now and I've changed up the holidays to play along with this weeks Sweet Sunday Sketch. 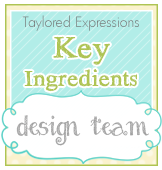 I turned to my "vintage" stash of Taylored Expressions Key Ingredients kits. I used papers from the kit which features patterned paper from We R Memory Keepers Winter Frost. I kept true to the sketch using only a few dies - make a snowflake & trim the tree. Very limited stamping as you can see. My hand isn't 100% yet, but I was having crafty withdrawals. Happy Weekend! I'm back playing with the Sweet Sunday Sketch Crew. I missed last week as I my plate was full, full, full! I'm so glad I was able sit down at my craft table yesterday and dust off my stamps and Copics to create today's card. I pulled out one of my older My Mind's Eye paper pads and started to look through it. As I thumbed through, I stopped on this one with the owl printed on it. I immediately knew I wanted to incorporate it into this sketch. I used Tag-a-Long Halloween set from Taylored Expressions for the pumpkins and bats. Little bits sign post & Wrought Iron Gate & Fence dies helped complete my card. Are you feeling fa-BOO-lous? 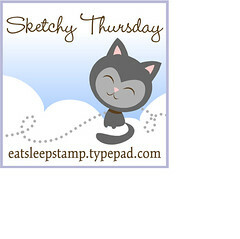 If not, then I suggest you play along with the Sweet Sketch Crew and this weeks fun new sketch! I dug threw my scrap graveyard and found this image from Taylored Expressions. It's an oldie but goodie - Fa-BOO-lous set. As you can see I took a little bit of liberty with the sketch. I just couldn't get the circle element to work for me. *grin* I also went old school with some vintage paper from Cosmo Cricket's Mathilda collection. LOL! You know how it is. Most things in the craft world are out of date within a few months. This paper pad was a few years ago! Yes I'm back with another Halloween card. I told you I was going to use every chance I could to play with my favorite themed holiday. I had so much fun creating today's card. It actually came out way better than I had initially envisioned. I love it when that happens. Hi there! 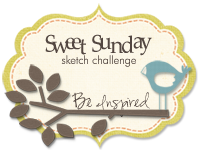 I'm back playing with another fabulous Sweet Sunday Sketch Challenge. I had so much fun creating today's card. I FINALLY inked up this adorable Pure Innocence image from MFT - Pretty Pumpkin. I kept pretty true to the sketch. Go me! LOL! I used many Copics to color my image. Here's s snap shot of them all. If you have any questions as to which colors were used on what, just leave me a comment. I'd love to hear from you! Happy Labor Day weekend crafty friends!!! As I type this up I'm literally all alone for the weekend. Yes, you read that right. Hubs is away vising my mother-in-law and kiddo is over at a friends. I can't recall the last time I had any alone time. Initially I thought ohhhh I can get so much housework done. WRONG! I quickly changed that tune and decided to hole away at my craft desk! For today's sketch I used my new You've Got Mail - Halloween stamp from Taylored Expressions. You can pretty much count on seeing a lot of Halloween stuff from me as it's my favorite! I'm so excited about today's post! I couldn't wait to start playing with Halloween crafty things. For a complete list of all the products I used for my card today scroll to the bottom of my post. I immediately loved this sketch from the first time I saw it. Soooooo many possibilities. I knew when I saw the new release from Taylored Expressions that I just *had* to use goodies from it for today's card. The window elements are from the new build-a-tag 5. I stamped the web images from Tag-a-Long Halloween. The kitty is also from that set. And the fab papers? Yep they are from the newest matched kit - Build-a-Scene Halloween. Love, love, love these papers! Happy Weekend! I'm back today playing with a new Sweet Sunday Sketch. 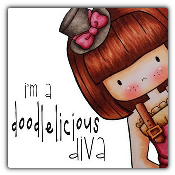 I finally broke out my coveted Papertrey Ink's Shakers & Sprinkles kit. I've literally had it for a LONG time. I'll admit I've opened it several times and admired all of it's wonderful goodies. I'm sure none of you have every done that with your stamping goodies. LOL! Everything I needed for the card (except for the card stock) was included in the kit. I think I caught the bug and will be making more with this fabulous kit.